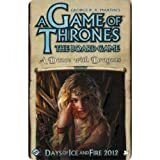 The use of ships to transport land-based units is a very important aspect of A Game of Thrones: The Board Game. It allows Knights, Footmen, and Siege Engines to take advantage of the seas to travel much faster than they would be able on foot. Any two land areas are considered adjacent for the purposes of marching and retreating when they are connected by consecutive sea areas (or a single sea area) each containing one or more friendly Ship units. 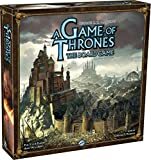 In other words, Ship units in consecutively adjacent sea areas form a direct "bridge" for Knights, Footmen, and Siege Engines to move directly from a coastal area to another coastal area in one move. 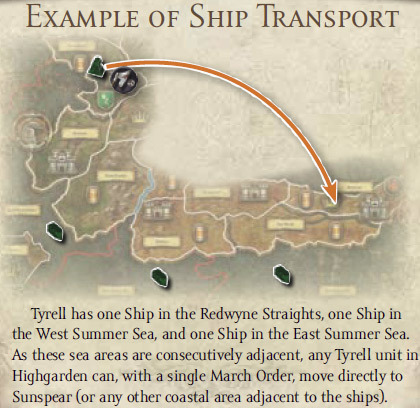 There is no limit to the number of times a player can use the same Ship unit(s) for ship transport in any given round. The same Ship unit(_) may even be used multiple times within the same March Order, transporting units from the area assigned a March Order to different destinations. However, a player may never use ships of another House as transports, even if given permission by that House. Ship units can facilitate ship transport regardless of the type of Order token currently assigned to their sea area. A routed Ship may be used for transport. Footmen, Knight, and Siege Engine units may, via ship transport, march into an enemy area and start combat there (remember, only one combat can be started for each March Order). Ship units cannot move using ship transport. While land areas connected by ship transport are considered adjacent for purposes of marching and retreating, they are not considered adjacent for any other purpose (including supporting and raiding).